I thought Kent handled balancing fact and fiction quite nicely; she paints an empathetic, portrait of a plain woman who struggled and had real feelings but has been historically regarded as an evil, heartless witch. It’s historical fiction based on real events and people. My knowledge of Iceland is extremely limited, and I had no idea about the last death by capital punishment in the country. 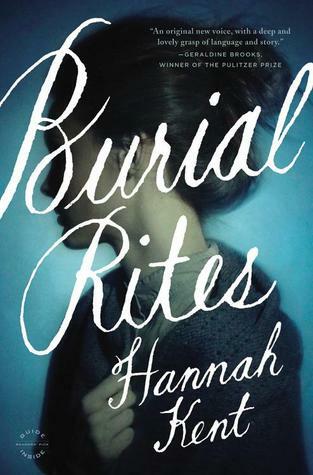 Burial Rites is a dark, speculative look at this period. I do wish the characters were a little more three-dimensional, but I liked the developed arc for Margrét, matriarch of the family with whom Agnes stays before her execution. The landscapes, weather, and lifestyles of Icelanders in the early nineteenth century were bleak and hauntingly presented, giving the whole book a very atmospheric vibe. Burial Rites is a beautiful debut. Kent’s prose is utterly moving and poetic here, with a quiet intensity that made this book a page turner. Her writing has a grace and maturity about it that makes me excited for what she may come up with in the future. Great book, highly recommend! Read from August 5 to 10, 2014. This entry was posted in books and tagged drama, family, fiction, friendship, historical fiction, mystery, true crime by kristin @ my little heart melodies. Bookmark the permalink. I hear that! It only took me a year to get around to this one after I bought it. I haven’t read this yet either. I’m glad you liked it and it wasn’t all just a lot of positive buzz when it first came out. It was great, I hope you give it a try!